The Kamiq small crossover is without a shadow of a doubt Skoda’s big debut this week at the Geneva Motor Show, but the Vision iV concept is also relevant and deserves our attention. Signaling the company’s big electrification agenda, the crossover-coupe looks surprisingly sleek for a Skoda and makes us curious about how the company’s production models will look in 2-3 years. 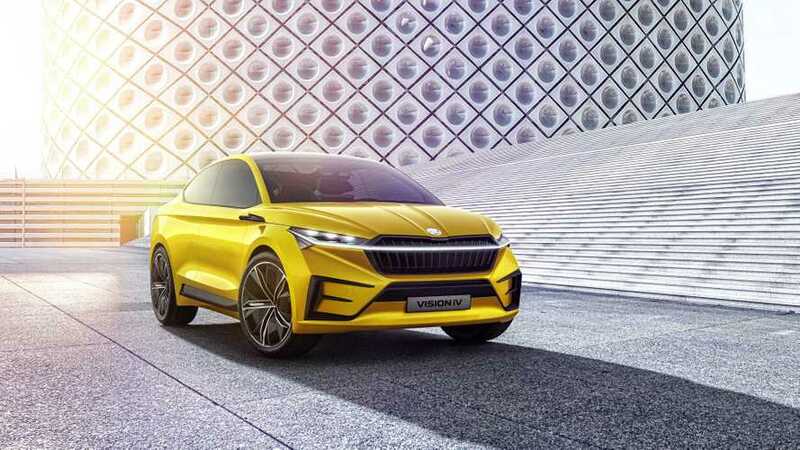 The Vision iV will go down in history as Skoda’s very first vehicle to ride on the Volkswagen Group’s MEB platform, which is set to underpin a plethora of VAG cars in the coming years. Surely the concept’s gargantuan 22-inch wheels and illuminated won’t make it to production, but those sharp body lines can already be seen on new products such as the Scala compact hatchback. With an electric motor mounted up front and another one at the rear axle, the electric concept features an all-wheel-drive system and integrates the flat lithium-ion battery pack into the underbody. The battery has enough juice for up to 311 miles (500 kilometers) in the WLTP cycle, and since its sits underneath the cabin, it doesn’t eat into the precious interior room.